To open a collection agency in the state of Illinois, you need to apply for a registration from the state Department of Financial and Professional Regulation (IDFPR). The registration requires that you comply with several requirements which include posting a financial statement, an employment history form, an Illinois collection agency bond, and more. 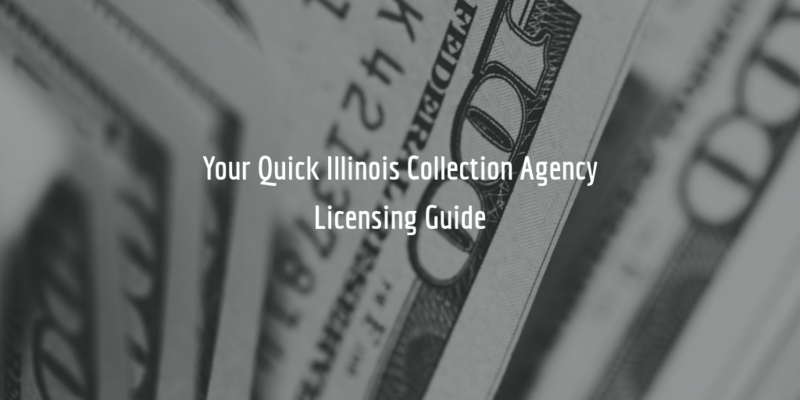 Read on to find out more about how to get an Illinois collection agency license! 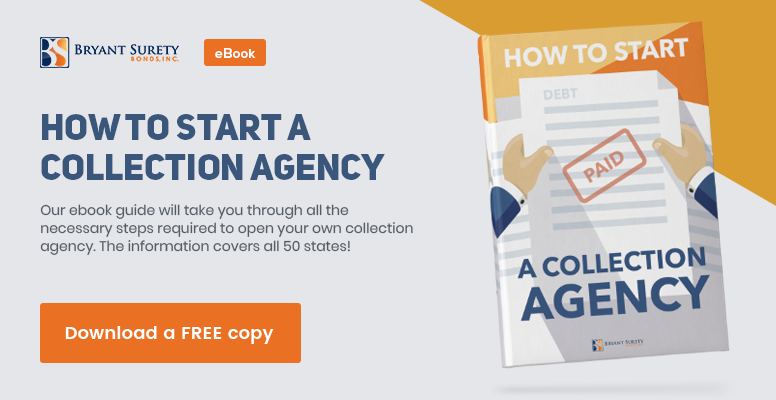 Learn how to open a collection agency in even more detail by downloading our FREE ebook guide! You must complete all of these forms prior to submitting your application. Here are some additional details about the type of information you will need to include. If you are a corporation or LLC, you must include your Articles of Incorporation or Organization. If you are a sole proprietor, your original assumed name document must be included. 1. The personal/employment history form must be completed by all owners, partners or officers of the agency, as well as managers or administrators of the parent and branch offices. If your agency is a corporation, the form must be completed by anyone who owns 10% or more of corporate stock. 2. For the financial statement to be complete, listed assets must be equal to liabilities plus net worth. 3. You must post a collection agency surety bond in the amount of $25,000. The point of this bond is to guarantee your compliance with Chapter 225, 425/8 of the Illinois Compiled Statutes (ILCS). 4. The employee identity listing must be completed only in cases in which employees of the agency use a pseudonym when conducting business. 5. The trust account financial report must be submitted with your initial application, as well as yearly when you apply to renew your license. As a collection agency in Illinois, you are required to maintain a trust account at all times. The account must always have sufficient funds in it for you to pay to creditors what is due to them. 6. If you will have a branch office, you must complete and submit the branch office form. Once you are ready with your application, you must pay a non-refundable application fee of $750. Though a trust account report must be submitted yearly, licenses are renewed every three years by May 31. You will be notified 60 days in advance by the Collection Agency Licensing and Disciplinary Board that you must renew your license. The bond required of applicants for a collection agency license in Illinois is intended to guarantee their compliance with the state law. In particular, the ILCS states that the bond is for the benefit of creditors who are clients of an agency. If an agency fails to pay money owed to a creditor, and collected on their behalf, the latter may obtain a judgment from a court. After obtaining such a judgment, they may file a claim against the bond to ensure they will be compensated for the failure of the agency. In this instance, the surety backing the bond will compensate claimants up to the full amount of the bond. After that, the bonded agency will need to reimburse the surety in full. This is the role of the collection agency surety bond. The cost of getting bonded is not the same as the amount of the bond. Bond cost is determined by sureties on the basis of an applicant’s credit score, and other personal and business financial factors. The higher an applicant’s credit score, the lower their bond rate will be. For applicants with a score of 700 or more, the cost of their bond can be as low as .75%-1.5% of the total bond amount. Want to know how much your bond will cost? Get a free quote by completing our bond form, and we will contact you shortly!